The relationship between the Illinois Neurological Institute (INI), OSF Saint Francis Medical Center and the University of Illinois College of Medicine at Peoria (UICOMP) has always been a close one, with INI specialists practicing at OSF Saint Francis while serving as faculty and leadership for the campus’s neurology and neurosurgery departments. Now, the organizations are relying on their relationship to draw the most promising neurology and neurosurgery medical students to Peoria for medical school and, hopefully, encourage them to establish a long-term practice in Peoria. Together, UICOMP, INI and OSF Saint Francis are increasing the campus’ neurology and neurosurgery offerings, hoping to prompt the best medical students, with an interest in neurology and neurosurgery, to opt for the College of Medicine’s Peoria campus. For the INI, this is an opportunity to ensure the neurology and neurosurgery services at OSF Saint Francis remain strong. Mentoring is a vital service to students, according to Elwood. INI and UICOMP have the resources to really benefit students, in the form of experienced, connected and respected faculty members. Mentoring is not just about guiding the decision making of students, it’s also about knowing the opportunities available to those students and making sure they get those opportunities. The INI has also set up a robust medical student research fund to support both short-term and long-term research experiences. There are laboratory opportunities involved in research around brain tumor, cerebrovascular, brain and spinal cord injury and degenerative brain disease. Plus, many of the INI’s clinical centers have active clinical trials that involve medical student participation. 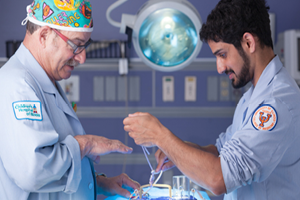 The sheer number of research opportunities, the large number of elective offerings at the 18 INI specialty centers, the peer support group for medical students and an increased number of fellowships and residencies will make UICOMP the best option for College of Medicine students interested in neurology and neurosurgery.